Computer viruses by far are the biggest problems I deal with when repairing computers in my Chicopee, MA location. When people come in with a virus problem, it is usually not just one virus they have, it is some were from 10 to 100 of them. These things manifest so quickly that a lot of times the only way to deal with them is to reformat the entire hard drive, this is not always the case. If the virus can be caught early on there is a good chance an anti-virus and anti-malware software scan can rid the computer of the problems. 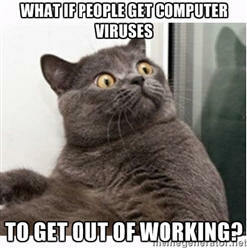 You can try to remove the viruses your self by following these tips. For best results use a bootable anti-virus CD, this means starting up your computer with a anti-virus program CD inside the CD-DVD rom drive. The best programs for doing this are going to be the free ones, however, it is very hard to find trustworthy free software over the internet, after all this is probably how you got the virus in the first place. Microsoft offers a free portable, bootable version of Windows Defender, you can download it from their website, this is the link, and it can work or help get you to a point where other anti-virus software can start to do its job. Microsoft's latest portable version of Defender is not their same old dead bet security. It has been working for me and other techs I know. If you have updated to Windows 8.1, Defender works as an all-in-one security suit and Microsoft recommends not using any other security or anti-virus software, I also recommend this. The reviews are pretty good from what I hear. I am using 8.1 with defender only and have not had any problems and I do a lot of downloading and beta testing. Once your operating system is infected it can no longer repair it self, booting from a portable anti-virus, anti-malware repair CD means the software on the CD is going to act as a temporary operating system, usually it will be in a DOS or Linux format, however, easy to understand and use. You may even have the option of recovering or backing-up your files to an external drive depending on the program your using. Kaspersky Anti-Virus software company also has a good free bootable rescue CD program, this is their link for the free download. Retail anti-virus software CD's sold in the stores are not going to be bootable. Once the software is installed it may have an option to make or burn a bootable CD repair disk, but you will need a second computer to do this if the computer you have is not working right. A lot of people are not familiar with booting from a CD or secondary device. Most computers will give you an option to choose your boot order or sequence when you first turn it on. This message will usually appear on the splash screen which displays the name of the computer, it goes by quick so act fast. A lot of computers use the F12 key, you have to press repeatedly on the key to get to a screen that will let you boot from the CD rom drive, which the anti-virus repair CD will be in. Some times people have to go into set up or the bois to change the boot sequence, this can be the F2 key, F1 key, Delete or esc key. If you press F11 or ctrl + F11 you might be able to reinstall Windows, be careful not to delete your personal files. F8 might bring you into a system repair utility, which if you choose repair computer will also give you an option to reinstall Windows. Reinstalling Windows with out backing-up your personal data will get rid of the virus and or other proplems. Every computer model is a little different and Google is full of easy to follow directions for your specific model. The big problem is going to be, being able to download these programs or getting connected to the internet, seeing that your computer has a virus and is not working right. You might have to use another computer to download these programs and burn them to a bootable CD. What ever you do, don't spend any money, this will only make things worse seeing that not only do you still have a broken computer, but now your broke. I'll say it again, the best software is free software. People living in Western Massachusetts can unconditionally have their computer viruses removed for only $50 by me. When you come to pick up your computer you will be able to fully test it before paying me. I will give you a 30 day guaranty verifying that everything is running fine and there are no underling problems on your computer. I will make sure you have both an anti-virus and anti-malware program on your computer that works with out costing any money to renew or update, AVG and Malwarebytes. These are the only two programs I recommend regardless of being free to use.